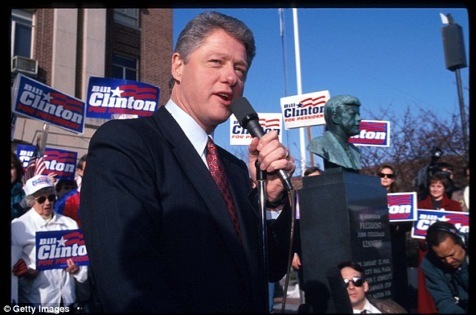 ”Comeback kid” Bill Clinton hit New Hampshire hard in 1992. Note to readers: Then and now, New Hampshire is the quadrennial February home of presidential candidates large, small and desperate. There were no “social media” outlets in 1992, making TV commercials of prime importance in the battle to emerge from the Granite State with a strut instead of a limp. They remain important, especially to the bottom line of New Hampshire’s lone broadcast network affiliate, WMUR-TV. But 24 years ago, candidates showed their spots with a vengeance while viewers braved barrages of attacks and promises. Here’s how it looked back then. This article was originally published on Feb. 8, 1992. MANCHESTER, N.H. -- If candidate commercials constitute an air war, then New Hampshire residents are being saturation bombed down the home stretch to the Feb. 18 presidential primary. Nader, running for president as a write-in candidate, is doing so without selling himself via 30- or 60-second TV spots. That’s something of a public service, considering that 11 candidates and some interest groups have bought hours and hours of time for their campaigns. From conservative GOP challenger Patrick Buchanan to liberal Democrat Tom Harkin, the candidates have made the economy the dominant theme of their commercials. So far, the eight Democrats on the air have avoided attacking each other directly. The majority of their spots mix thumbnail biographies with pledges to provide jobs and health care for all. This lone Buchanan ad, airing more than 25 times a day, is intended to be a gut-level rebuttal to the president’s more polished performance in a 30-second commercial filmed in the Oval Office. Invariably airing within five minutes of the Buchanan ad, the spot has Bush talking up his recently unveiled economic plan. “But I need your help now, to send a real message to Congress to get this job done,” he says. On Friday, the Bush campaign added a new spot that uses images from the Persian Gulf War to dramatize his battle with Congress. These spots are quite different from the sharp attack ad the Bush campaign aired against Kansas Sen. Bob Dole the weekend before the 1988 New Hampshire primary. That spot, titled “Senator Straddle,” helped Bush win a come-from-behind victory. This year, the candidates have chosen Manchester’s WMUR-TV, the state’s only network affiliate station, as their principal playing field. The station, which reaches about 90 percent of New Hampshire’s 1.1 million residents, has been airing between 150 and 200 presidential candidate commercials a day, according to assistant sales manager Julie Campasano. But in the final week of the campaign, “upwards of 90 percent” of WMUR’s available commercial time -- more than 300 spots a day -- will go to the candidates, she said. The motherlode of media imagery is WMUR’s one-hour early evening newscast, which runs from 5:30 to 6:30 p.m. Thursday’s program was typical. Nine candidates aired 18 commercials that ran for a combined 11-and-a-half minutes. Each 30-second spot was bought for a $400 reduced rate -- which candidates are entitled to under federal law -- instead of the $700 going rate, Campasano said. “It’s great for a campaign to come in here and be able to afford to buy television commercials, even if they don’t have a lot of money,” said Maura Keefe, state press secretary for Democratic presidential candidate Bob Kerrey. WMUR had sold more than $600,000 worth of political commercials through Thursday. “Compared to 1988, it seems to me that we’re airing many, many more spots for less money,” Campasano said. In the closing weeks of the campaign, Bush, Buchanan, Kerrey, Harkin and Bill Clinton have been making the maximum buys -- one minute per half-hour -- on newscasts and during WMUR’s heavy lineup of daytime talk shows. A 30-second commercial on Sally Jessy Raphael, which airs weekday mornings, costs a candidate only $25. The environment isn’t always ideal, however. On Thursday’s Sally, a Bush ad aired within minutes of the host’s conversation with stripper Toppsy Curvey. Candidate commercials have been far less visible on the three Boston network affiliate stations that are beamed into most of New Hampshire. Those stations prohibit political ads within newscasts. But at WMUR, “we’ve always run them on our news during the primary season,” station manager Tom Bonnar said. After doing a live interview on Tuesday’s early evening newscast, Harkin strolled over to a WMUR monitor to watch one of his commercials. “I’m gonna make a quick call and find out why my new ad isn’t on yet,” he said. Harkin’s latest commercial turned up the next day. A narrator touts his successful fight to pass the Americans with Disabilities Act and Harkin is pictured with his deaf brother, Frank. Meanwhile, Democratic candidate Jerry Brown has bought a handful of 30-second spots to promote his latest half-hour program, Take Back America, scheduled to air a week before the election. Besides his 30-second attack ad, Buchanan has purchased two half-hour slots on the eve of the primary. Three “minor” candidates -- Republican Jim Lennane and Democrats Charles Wood and Larry Agran, the former mayor of Irvine, Calif. -- have been running more ads than Democrat Paul Tsongas. Kerrey’s first commercial, which the candidate himself recently criticized, showed him talking tough from a hockey rink about unfair trade. His hastily revised ad campaign is anchored by a biographical spot that depicts him as a courageous outsider for whom “politics is a cause, not a career.” Other spots emphasize his commitment to universal health care. The air wars also have included political commercials by the American Association of Retired Persons urging health care reform and a Bush-bashing ad paid for by the New Hampshire Citizens For Action. Beginning Thursday, New Hampshire residents can critique the commercials via a hotline 00 1-900-RUN FAIR -- sponsored by the League of Women Voters and the American Association of Advertising Agencies. If enough voters sound off, the 900-line will be used in other primary states. “We feel something has to be done to make the electorate feel more empowered, said New Hampshire League president Ginger Culpepper.